Westworld gets a smart upgrade with a thrilling, violent and self-aware start to Season 2. This is a spoiler-free review of Westworld Season 2, based on its opening five episodes. Don’t want to know anything beforehand? Click here to find out how to watch it online. 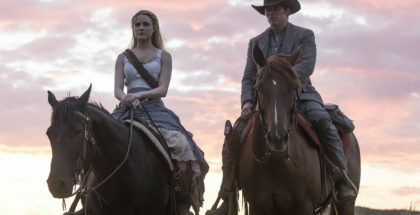 “These violent delights have violent ends.” That was the promise of Westworld’s first season, a promise hard-wired into the theme park by its creator, Robert Ford, and baked into its robotic hosts, whose growing sentience (and awareness of their mistreatment at the hands of the human guests) sparked an inevitable uprising. Season 2 drops us right back into the aftermath of that revolution, and carnage is in the air. 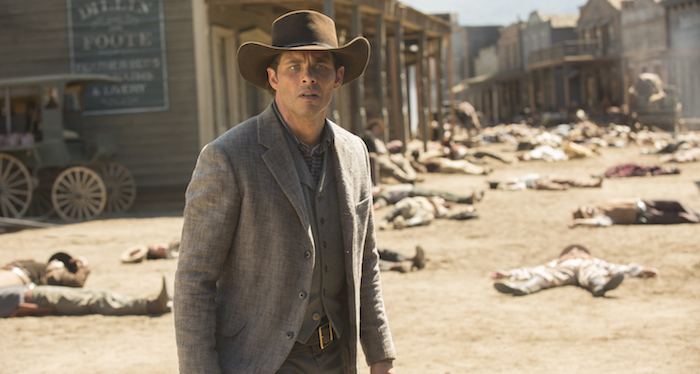 The result is an exciting, fast, ambitious, and gory start to Westworld’s sophomore run. Those violent ends make for violent beginnings. This, we’re swiftly reminded, is a brutal universe – a place where rich, white men pay to get their kicks, given a sandbox to play in with nobody watching. The result is exploitation, abuse and murder, with the robotic hosts tossed aside as second-rate beings, before being repaired and sent back out again for another go-around; playthings for the wealthy with no rights, respect or power. Season 1 slowly turned that on its head, with the subjugated victims gradually reclaiming their humanity back from their owners, the would-be masters and creators of the Delos corporation. The fact that this revolt is led by two women – brothel and bar owner Maeve (Thandie Newton) and ranch hand Dolores (Evan Rachel Wood) – has made that twist of fate all the more satisfying to witness. In just 10 episodes, HBO’s sci-fi epic established a distinctive style and tone for itself; a mix of gratuitous violence and thought-provoking meditation on consciousness, all wrapped up in an intellectually self-aware package. Season 1 was a puzzle box asking to be unpacked, playing with chronology, withholding information and speaking in riddles to try and draw fans in. They responded by realising that the show was split into two timelines, and that Ed Harris’ The Man in Black and Jimmi Simpson’s William were the same person. For Season 2, creators Lisa Joy and Jonathan Nolan retorted by offering the online community a video detailing all of Season 2’s spoilers, only for the video to turn out to be a massive Rickroll. While that might seem like a sign of more misdirection to come, Season 2’s first half impresses by putting such crossword storytelling on the back burner. The different approach is, to some degree, unavoidable. Season 1’s endgame was already on the cards, with the show filling its hours before the climax with shades of backstory and emotional weight. With Season 2, though, the endgame has already happened, and it’s opened up the sandbox into a wide playing field. Where this expanding universe leads is anybody’s guess; all we can do is ride the wave of revolution. 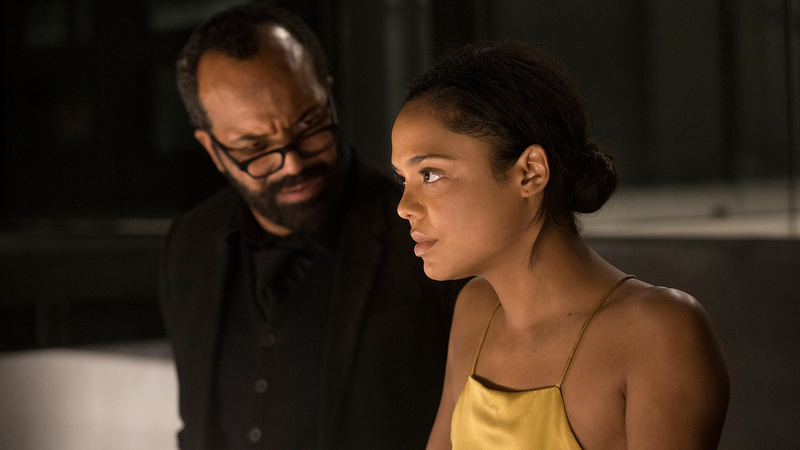 It’s one heck of a ride, but with Ford out of the picture, there’s no disguising that Westworld’s remaining human inhabitants aren’t all that compelling. 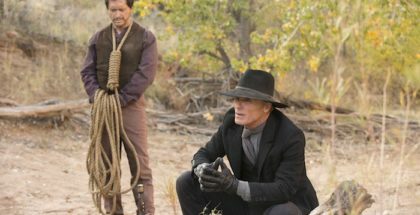 Ed Harris’ The Man in Black is delighted to discover that his dreams have come true, with Westworld finally carrying the stakes of real life, but he’s far from a sympathetic character – his plunge into the moral abyss last season was shocking, but there seems little left to learn about him now. Joy and Nolan introduce some fascinating scenes that see him and Peter Mullan (on superbly wicked form) spar verbally, but William’s role as window onto this world has been superseded by a more compelling figure: Bernard. That, in itself, is a telling change in focus. While the stakes are now all too real for humans, as the hosts can actually harm and kill them, the stakes are also higher for the robots. There are no human engineers around to fix them, and only the value of their IP to spare some of them from bullets; on both sides of the fence, the battle now means something. Bernard straddles that fence with a unique perspective on the conflict. Programmed to think he was human, he’s so good at blending in that other people can’t tell the difference, even as his circuits spark and sputter with the ongoing understanding of what he is, and which of his memories are real or not. 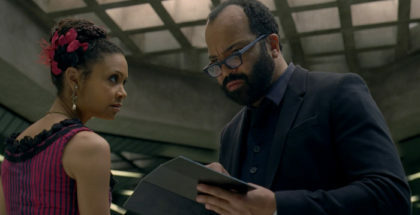 Jeffrey Wright was one of the best things about the first season, so it’s a treat just to have his ponderous presence back on our screens, and he digs deep into Bernard – and Arnold, Ford’s co-creator, whose consciousness was encoded into him. The result is a man torn between retribution and survival, between sympathy and selfishness, between repairing and destroying. Dolores, like Bernard/Arnold, shares an understanding of both the theme park world and the real one, and it fuels her radicalised rebel leader with a fiery conviction. Evan Rachel Wood was enjoyably unnerving in Season 1, her demure, polite facade giving way to the homicidal Wyatt lurking beneath the surface. Here, her best moments come as her new persona slips and gives way to the friendly face of old – the tension stems not from when she’ll strike, but to what extent her actions are a result of Ford’s programming or her own making. James Marsden, too, gets more to sink his teeth into, as Teddy comes to grasps with his own freedom, but does that mean his feelings for her, which were coded into him long ago, are genuine? We know she will go to any extreme, sacrifice anyone, to achieve her goal, but now that he has a say in his own story, does Teddy want the same thing? Dolores’ cloaked references to the real meaning of the place, and her covert mission, have lost some of their allure, but the questions of free will that her actions raise are endlessly intriguing. 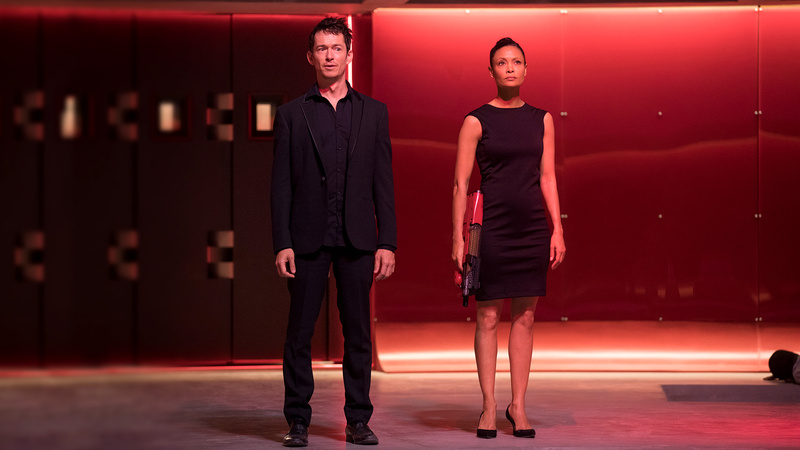 And this shift is Westworld’s greatest (and most effective) of all: Season 2 is less driven by its creators’ secret narrative, and more by the characters themselves. That switch is beautifully juxtaposed by Maeve and her unlikely, and immensely rewarding, sidekick: Lee Sizemore (Simon Quarterman). One’s a charismatic, resilient fighter, who never hesitates to grab her own computer module and override her own settings; the other is the petty, pathetic writer of the park’s stories, who once decided the hosts’ motivations for them. 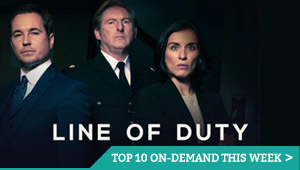 Quarterman revels in the chance to bring some welcome comic relief to one of TV’s most serious shows, complaining that Maeve isn’t following her script, while she complains that his writing is shallow and broad. Ordering him to take his clothes off in one scene, he becomes partly a figure of atonement for the first season’s male gaze, but also a chance for the show to do what it loves most: be exceptionally self-aware. When these two are on screen, Westworld flies along with wit, humour and genuine peril – this is an upgrade of the smartest order. As Maeve reconciles her thirst for justice with the innate drive of Season 1 to find her daughter, an underlying theme emerges – not of human guests using the park to find out who they really are, but of the hosts looking to the outside world and working out their own true nature. The show itself feels like it’s undergoing a similar evolution, pushing and pulling its own limits – from Western-style shootouts to pertinent observations on personal data – to discover its future. There are fewer puzzles here, but endless new ground to explore. Any Easter Eggs lying buried beneath? They aren’t there for us. Westworld Season 2 premieres in the UK at 2am on Monday 23rd April on Sky Atlantic, and is available on-demand after that simulcast. Don’t have Sky? 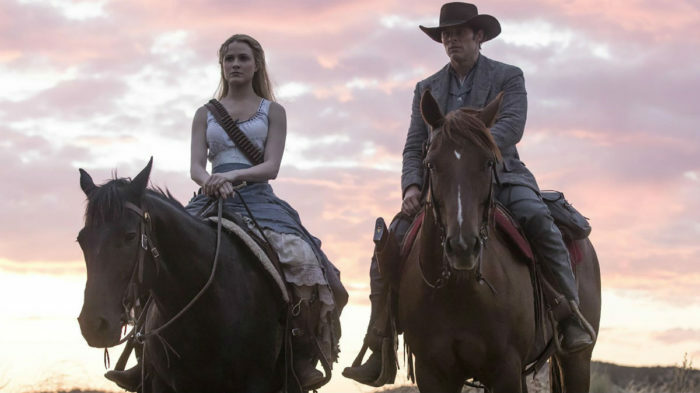 You can also stream Westworld legally on NOW TV, which gives live and on-demand streaming access to Sky’s main TV channels, including FOX UK (Legion) and Sky Atlantic (Billions), for £7.99 a month – with no contract and a 7-day free trial.